Ghana, Africa's most stable democracy and one of the fastest growing countries on the human development index, got a jolt this July when Unicef said that the country would take 500 years to become open defecation free. According to Unicef, the country loses about US $79 million a year due to lack of access to safe sanitation. The news was also ominous for Africa, because if Ghana, a rising economy, cannot check open defecation, the continent as a whole barely stands a chance to fight the menace that is one of the United Nations Sustainable Development Goals to be achieved by 2030. Consider this. In 1990, about 22 per cent of Ghanaians would defecate in the open. As per United Nations Millennium Development Goals (MDGS) adopted in 2000, of which Ghana was a signatory, the country should have reduced this numbers by half by 2015. 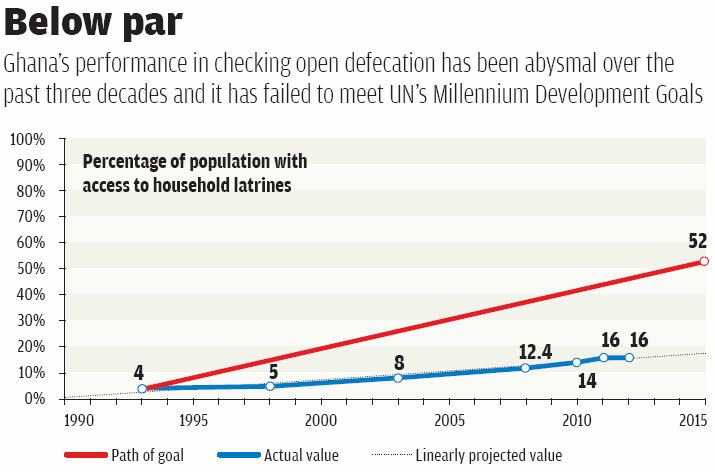 But the figure stood at over 19 per cent that year, says Emmanuel Addai, a sanitation expert with Unicef. 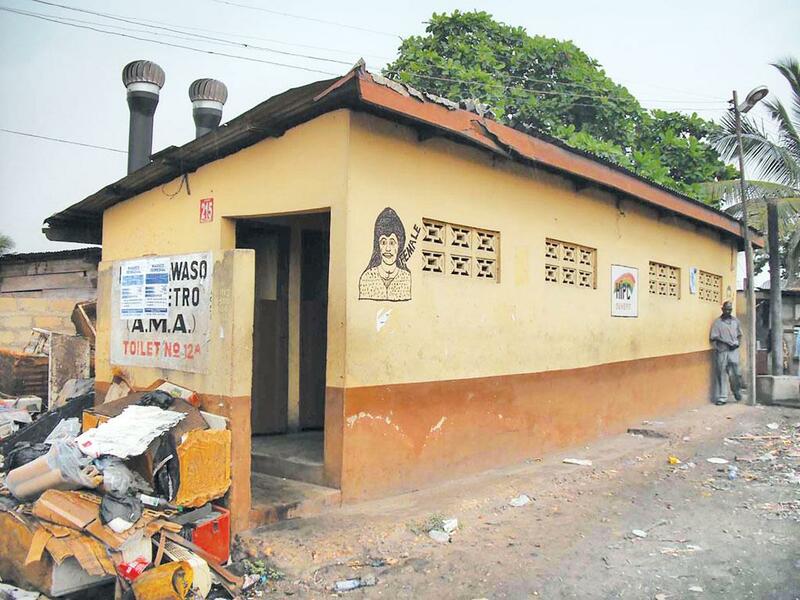 Another MDG was to provide at least 50 per cent Ghanaians access to household latrines. But Ghana’s performance was appalling on this front too (see ‘Below par’). Where is it going wrong? The reasons are many. For instance, till January 2017 the country did not have a dedicated sanitation ministry. Works related to sanitation were overseen by the Ministry of Water Resources, Works and Housing. “We welcome the decision to create a new ministry,” says Abdul-Nashiru Mohammed, country director of international non-profit Water Aid, and adds that the decision has made coordination with the ministry much easier. The government is also guilty of not providing enough funds for sanitation. In 2015, Ghana announced that it will increase its spending on sanitation to 0.5 per cent of its GDP by 2020. But the allocation in next year’s budget was an abysmal 0.01 per cent. And the budget in 2017 was 16 per cent less than that in 2016. The problem is also cultural. Most Ghanaians associate heat and smell from latrines with diseases, and believe open defecation is the cleaner option, says Addai, adding that the government did not take measures to induce behavioural change. A study published in BMC Public Health in July 2016 says that “increasing migrant population and the high demand for housing in the face of limited available space has resulted in general unwillingness and inability to establish private sanitation facilities in the communities” in Ghana. It also says that landless people are unwilling or unable to spend on sanitation. About 80 per cent of Ghana’s population is landless. Ghana is one of the few African countries that are not plagued by wars or famines. According to the World Bank, 55 per cent of the population had moved to urban areas by 2016 from 23 per cent in 1960. But it still is second in Africa in terms of people that defecate in the open. Sudan is first in the list, but the country has suffered from decades of civil war. In July, the World Health Organization and Unicef published Joint Monitoring Programme 2017 report which stated that Ghana’s progress was still slow. Apart from a large number of people practicing open defecation, 54 per cent people use community latrines, says a 2012 Water and Sanitation Program report by the United Nations on Ghana. So what is the way out? In July, Kofi Adda, Ghana’s Minister of Sanitation and Water Resources, said that the country will be open defecation free by 2020. The claim appears tall. But the government has changed its approach, says Adda. Since 2010, Ghana has adopted a Community Led Total Sanitation (CLTS) approach. The initiative seeks to bring about a behavioural change through community mobilisation. Government officials and non-profits visit villages and communities and inform them about the benefits of household toilets. No subsidies are provided under CLTS to build toilets. “If people invest in toilet construction, they would be more inclined to use them,” says Mohammed. About 25 non-profits are implementing CLTS across Ghana. The initiative was launched in 50 districts on pilot basis in 2012-13 and is now being run in 140 of the country’s 216 districts. Adda says the approach has been adopted by almost all district assemblies which, in turn, have supported 3,000 rural communities to achieve open defecation free status. Tony Tsekpetse, national co-ordinator of the CLTS project, told Down To Earth that the approach has begun to show results in the last couple of years. The government has also started taking action against people for open defecation. For instance, in Sekondi Takoradi city of the Western Region, an administrative unit of Ghana, 21 people were arrested on August 25 while another 28 were arrested on August 24. On September 7, Rockson Bukari, Minister of the Upper East Region, ordered all 13 municipal and district assemblies in the region to constitute task-forces to arrest and prosecute people defecating in the open. A study published in 2015 in International Journal of Innovative Research & Development indicates that government policies to promote use of household latrines should focus on women. The study found that households headed by women were 12 per cent less likely to resort to open defecation. Mohammed says inter-ministerial co-ordination still needs improvement. “The government should involve the health ministry in efforts to improve sanitation,” he says, and adds that instead of focusing on grants, the government must increase the sanitation budget. Responding to the slow improvement on the open defecation, Tsekpetse says that the government’s initiatives are still new. “It takes time to bring a behavioural change,” he concludes.